Great Eastern Buildings were a product of the Great Eastern Rail Company which ran services from East Anglia to Liverpool St Station and erecting the Buildings in the nineteenth century as cheap workers’ accommodation to support the development of the railway line. However, by the sixties, ‘great’ was the most unlikely epithet and no one had ever known them to be anything better than the lower end of the housing market. The two tenements were subdivided into three sections with each section having a staircase running the height of the building. Each section had four flats on either side of the staircase, thereby providing a total of eight homes in each section. The first and third sections of the left hand block consisted of both one and two bedroom dwellings complete with inside toilet and bathroom, but those unfortunate enough to occupy the second section of the left hand block still had the pleasure of outside toilets and washrooms as per the original Victorian design. The size of the dwellings – no flat had more than two bedrooms – often had little bearing on the number of people occupying them. Large families were not uncommon and I was one of four siblings. The usual rules applied, the parents had one room and the children had bunk beds in the other. Those on low incomes who could only afford low rents did not find themselves in a position to debate the complexities of the situation. It was how life was then and people did the best they could. On the other hand, if you were fortunate enough to have an extra bedroom there was a chance to earn a few quid by renting it out. My grand parents did this. They occupied a two bedroom flat and, in the fifties, they rented their spare room to Davy. He was a short, stout man with a slightly crazy laugh, bald head and National Health Service spectacles – who always paid careful attention to his tie knot, his white starched shirt and his precision shaving on a Saturday night when he hoped to get lucky. I remember being strangely fascinated by Davy’s shaving and would frequently watch him as he exercised his careful linear strokes, followed by vigorous swirling of the razor in water to clean it. 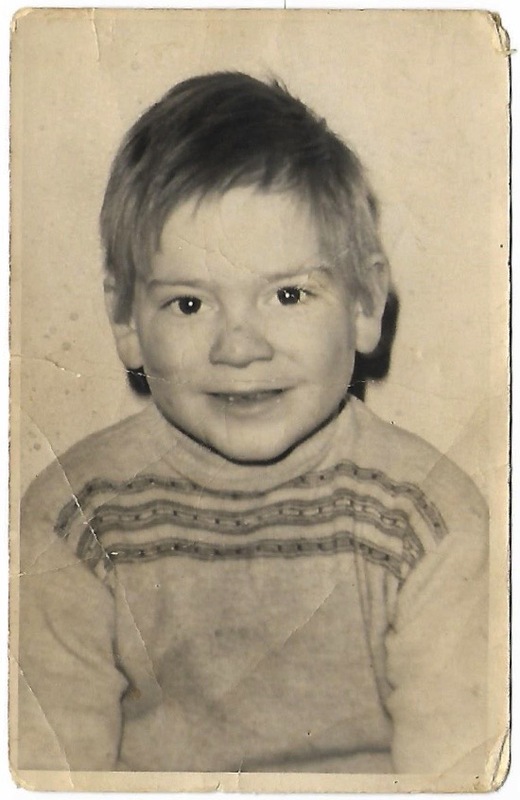 I believe Davy was a friend of my uncle Tom from their days of military service who simply needed a few weeks of lodging to sort himself out and find his own flat, yet by 1970 – when I moved out of the buildings – he was still there. The construction of Great Eastern Buildings left much to be desired, both inside and our. The coal-grey brickwork, which had not been cleaned for decades, had not stood up well to weathering. Word had it that there was red brick incorporated in the Buildings but, apart from a line of red bricks traversing the length of the roof, it was hard to recall. Maybe this is reflective of a grey and dull existence? Yet life in and around the buildings was punctuated by colour. ‘Barmy Park’ in Bethnal Green (named after the asylum that once stood there), Vallance Rd Park (known as Weavers’ Fields) and Victoria Park (the biggest and best known) were no more than a ten minute walk away, where we could see trees, ponds, birds and enjoy running around on the grass. In some ways these three parks marked the boundaries of our hinterland beyond which we rarely ventured. Within the immediate vicinity of the buildings there simply wasn’t anything of greenery that I recall. My Aunty Pat informed me that Great Eastern Buildings were owned in the fifties and the sixties by none other than the notorious racketeer and slum landlord Peter Rachman! His acolytes were always there when the rent was due but never when repairs were needed which, given the state of dilapidation, was very frequent. In fact, it was only in the early sixties when Rachman sold the buildings that any work was done, and indoor bathrooms and toilets were installed. For many of the residents, avoiding paying the rent was a priority, hence weekly rent collection day – normally a Monday – was an interesting game of cat and mouse. The tendency to live it up at the weekend often left shortfalls and so the visit of the rent man was greeted with absence or no answer. It was not uncommon to be told ‘keep quiet and don’t make a sound,’ accompanied by threats of physical chastisement, should the rent man turn up when we were at home. On several occasions I was told by my ‘live-in stepmother’ Lotty not to make a sound when there was an unexpected knock on the door. In her case it could have been any amount of reasons, since she was implicated in many dubious activities, but the rent man was always unwelcome. Rent was the biggest outgoing that anyone faced. 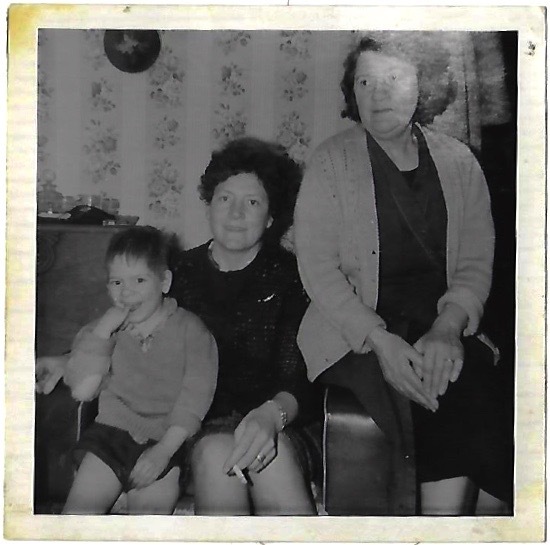 In 1969, it stood at 25 shillings weekly for my Aunty Pat’s family with an income of £12 per week, but for those living on benefits it was a bigger imposition. I do not recall anyone ever discussing the concept of buying a home and, certainly, I never heard of the word ‘mortgage’ until my twenties. Nobody seemed to even dream about it, as if renting was the only way. And we performed this never-ending dance with the rent collector. I’m not sure what we hoped to achieve because the rent had to be paid whether we liked it or not, but I think that such avoidance won enough time to source other forms of income, thereby allowing the rent to be found. Although Aunty Pat had sufficient control over her finances to pay the rent, many others – like my folks – did not. Yet even for the ‘good ones,’ it was always possible to discover a ‘cash flow difficulty’ by trusting payment of the rent to those it might be better not to. This was the fate of Aunty Pat when she trusted my stepmother, Lotty, to pay the rent on her behalf one week. Normally Pat would pay it herself, but her working hours had changed, so she could not be there to pay it. On this particular occasion, she was approached by the rent collector, asking ‘Pat, why haven’t you paid the rent?’ which drew the reply, ‘I have, Lotty paid it for me.’ At this point, Pat produced the rent book which had been signed by the rent man to indicate receipt of the rent, only to be informed ‘that’s not my signature.’ It was painfully obvious. When confronted, Lotty broke down, admitted the forgery and agreed to pay it off at two shillings a week. Fortunately, it never went any further, though Pat was more careful with whom she trusted her rent money afterwards. My father could deal out that sort of thing too. Somewhere around the age of eight or nine I managed to upset him, again how I did this I can’t recall – perhaps this lack of awareness is the hallmark of childhood? - but he charged into the front room, threw me onto the sofa and proceeded to punch me in the back. Though he could have hurt me much more than Lotty, I didn’t feel the same anger or need for retribution, perhaps because he was my natural father. Neither was I alone, physical chastisement being a way of life for children in the building, as was physical conflict for adults. Yet my father didn’t commonly behave like this towards me – being something of a laid back character, much more likely to crack a joke or puff an exotic cigarette than to be violent. I can only imagine that on this occasion, as with Lotty, I must have done or said something to really anger him. Because of the physicality of life in the buildings, my father had to give an impression of being able to ‘handle’ himself and so his teddy-boy background proved helpful. Later, it became increasingly evident that my father preferring to interact with my cousins than me. I think this was due to the path that I took in life. After moving in with my uncle and aunt, and gaining entry to the local grammar school, I became increasingly academic and more middle class. Or at least was seen like that. It was a problem for my father who evinced disappointment during my teenage years, giving the impression of wanting a son who was more working class and manually inclined. There were always taunts about not being able to do anything practical – ‘Good at reading books but can’t fix a plug, can ya?’ Fixing a plug was a skill needed in the buildings, whereas reading Geoffrey Chaucer or William Blake was not going to improve the quality of life. In the tough environment of the buildings you would not find what might be described as a culture of praise. People did not compliment each other overtly. Today I understand the practice of sarcasm, which may have been a means for people to compliment each other without being seen to do so. 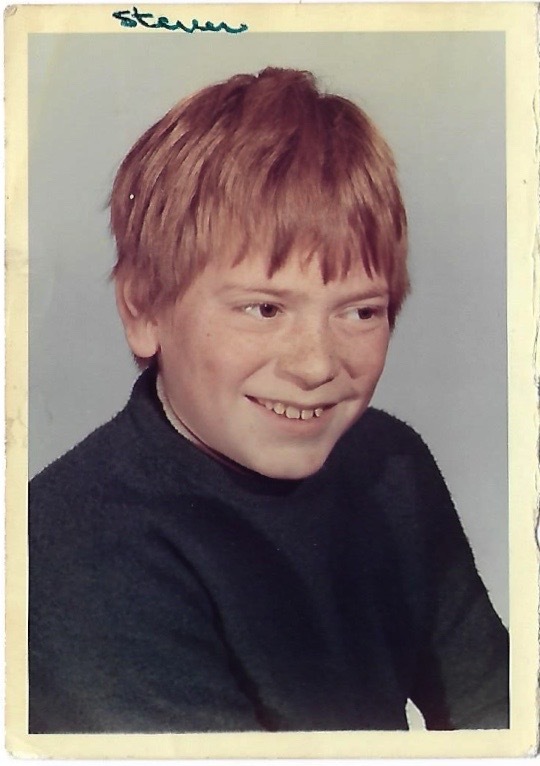 When I passed the 11+ for entry to the local grammar school in 1969, no one, as far – as I can recall – said ‘Well done’ or anything else for that matter. It was as if it hadn’t happened. I can now recall that sense of disappointment at not being recognised for achieving something no one else had done. It was the foreboding of a sense that grew stronger and stronger through my teenage years – of not belonging and of not being one of them. I suppose my dad’s behaviour in giving me a walloping should not be surprising as he was a product of his environment. That existence, apart from rendering physical chastisement acceptable, looked on education in a contradictory way. Learning was to be admired yet also regarded with contempt since it didn’t produce any tangible reward. So it was that he liked having a ‘clever son’ – which conferred status on him – but couldn’t identify with me because I was never going to be productive in a way he understood. This reality was painful: with a mother who had abandoned me and a father who seemed disdainful to me, my internal emotional turmoil was immense. My Dad didn’t always get things his own way. I recall an incident around 1965 when I had wandered out of the buildings and was heading down Quaker St towards Wheler House. About 50 yards along on the left hand side, facing Leon’s shop, was the Grey Eagle. Out of the pub hobbled my father, covered in blood, with torn clothing and clearly in distress. He sank to the ground against a wall. Later, it transpired he had broken his leg or had it broken for him. Then another man came out of the pub and started kicking him. Upon seeing me, my father called out ‘Alright Paddy, pack it in, my boy is watching.’ Paddy glanced in my direction, swore at my father, kicked him once more and then went back to the pub. Lest I give a negative impression of my father, I have a wonderful memory that endures. One morning, around 3am, in the summer of 1969, my father came into the bedroom and woke me up. ‘Steven, Steven, you’ve got to come and see this,’ he said. I hadn’t a clue what he meant or what was happening, but I got up and followed him into the front room. He was staring at the TV, and he ushered me to sit down and do the same. In that slightly fed up and rather bored manner so beloved of children, I sat there and looked at our little black and white TV set. There appeared to be little to see – just a piece of empty ground from what I could tell. After several minutes of looking at this nothingness, a small shiny cylindrical object hovered into view and appeared to settle on this piece of ground. A little time later, a man completely enclosed in a heavy suit emerged from the object. I didn’t appreciate that I was watching a piece of history – the first man on the moon – but from my fathers’ demeanour I knew it had to be of significance. Looking back on it, my dad clearly wanted me to be part of something special, something that was a landmark moment in human existence, and in this he succeeded. 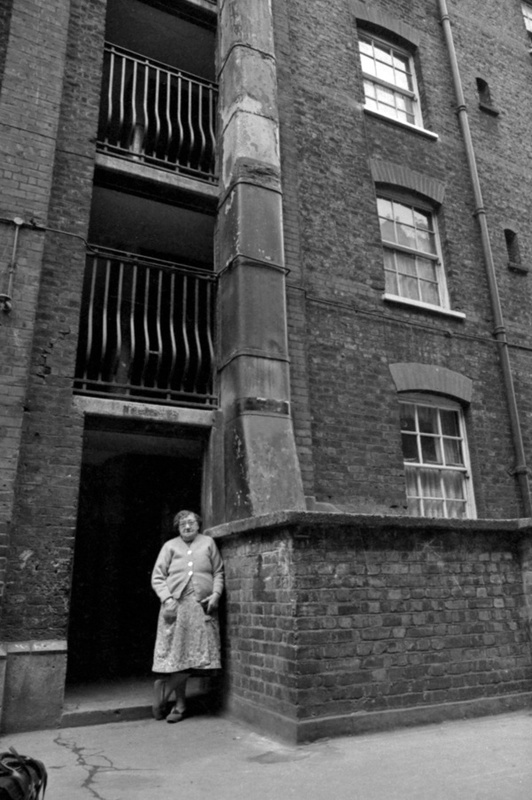 Walking around swanky Spitalfields today you can be completley unaware of what life must have been like. We might have wanted to forget as much as possible but Mr Harris’s redolent writing brings it back to life in all its glory. People who say modern life is too complicated and we should return to the good old days of simple, honest living would do well to read Mr Harris’s blog. I’m also from Bethnal Green, and grew up in the same era as Steve. This brought back so many memories of things that happened to me, all brought on by the careful construction of how things used to be in the early 60s. I don’t remember avoiding the rent man, though! The story with the line; ‘Pack it in, my boy’s watching’ really did ring a bell, with the East End hard-man mentality really ringing true. There was a brutal sympathy there as well. An interesting memoir ,giving a genuine “Whiff” of a time and place. Thank you GA and thank you Steven, your memories are brilliant and very emotive. A wonderful story! Is there more of this? My sister was born in Great Eastern Buildings, and lived there with our Brother and parents and Grandparents throughout the war. My Parents lived in one flat and Grand parents lived in No86 at the time. All the family stories I hear, painted a story of friendship and help for one another, and my brother and friends getting a clip round the ear, for standing on the roof watching the planes dog fighting in the sky, during the war. My Great Gran moved into the flat when they were new, and my Grandparents moved In when married in 1907. @Chris Hall. Chris, you are right in that there was a great sense of community in the buildings, despite the issues and hardship. My little piece here is just a part of a much bigger work – in that you will see how people did come together and how much we loved those buildings, despite everything. Would love to know more about watching those dog fights! Thank you Steven for this excellent write up of these buildings and the way we lived in the 50s and 60s we had no luxuries like today, but reading this article left me laughing crying. so nostalgic my head felt like a little cinema with all those wonderful memories of great eastern buildings showing like a film .Even if you never lived in buildings like these, I’m sure many people would find this account not only interesting but fascinating – love the photos Steven, cheeky little face. That was a lovely read. 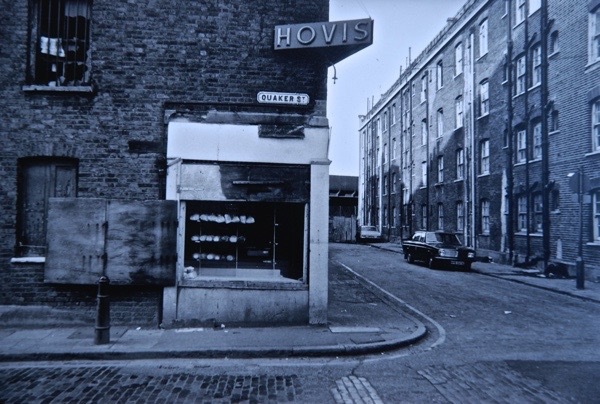 Memories of my younger days in Bethnal Green came flooding back and the pictures made me think of Butler Estate, where I lived until the age of 6. Looking back, life seemed a lot simpler back then although not always better (give me indoor plumbing any day). Nice one Steve. Nice bit of writing – an evocation of times and places long gone now but hanging so vividly in the memory. I hung out with Steve from grammar school to our late twenties and although everyone’s East End upbringing is unique the shared experience forges a bond for life. Look forward to the full publication. Certainly brings back memories. Remember all those who lived in GE Buildings and Quaker St. during the 6o/70,s and the excursions over to Trumans storage in the hope of filching a few beers. Great piece of writing Steve, let’s hope there is some more from you. The piece brought back memories of my time in the Bow in the same period. It seems from your piece that we were just of many families who went quiet when there was a knock on the front door to avoid the rent man although to be fair to him, it wasn’t just the rent man as we did it to anyone who was collecting money. I recall these blocks of flats as walked to and home from my primary school All Saints in Buxton Street to say they were at the lower end of the housing market is an understatement,they where overcrowed poorly maintained and rat infested i used to see these vermin running around the courtyard,those who lived there and some were my friends should have been paid to live in such Dickension conditions lets forget about not opening the door to the rent collector,it was the blue of sky and the gold of the sun outside these squalid tenements that made life a little more bearable for those who lived in Gt Eastern Buildings,many thanks to Steve for an interesting article. Thanks for adding your recollections Neville – you are correct. They were squalid and shameful in many ways, not least as you indicate. The extract you read here is just a small part of a much, much bigger production where I talk about the things you describe, not least the ‘rat fishing’ – a squeamish topic which I wont go into here. Yet oddly, despite those privations, so many of us who lived there hold those buildings in affection and are very nostalgic about them and, if I could go back to those buildings, I probably would! I found this a wonderful account and very moving. It rings very true and is painfully fair. I remember Great Eastern Buildings well from when I worked in the area in the early 70′s, and for many many more years than that they were visible from every train going in and out of Liverpool Street station, one of the first things one saw as one left the station and just about the last as one came in again before the roofs of the station itself closed in. I look forward to reading more of your work in progress Steven – oh, and I too love the photos! Steven – I was really please to read your article on Great Eastern Buildings. There is hardly anything written about them and yet The Buildings surely have huge historical and social interest, which can only be told by people like you who lived there – it’s about time they were ‘put on the radar’. I really like how you have describe The Buildings, and also how you’ve captured the people who lived there as products of their environment , their physicality, Davy’s meticulous grooming, the etiquette of not beating up a man when his son is watching, then Sheila’s light breeze of hops passing through buildings, manual workers’ distrust /contempt of Grammar school education. My Mum’s family lived at number 87 from (an estimated) 1910 until WW2 broke out. there was eight people in their flat. Neville T – Mum went to All Saints School Buxton Street too, there’s not much written on the school either. Keep writing Steve, they were interesting times in an interesting place. 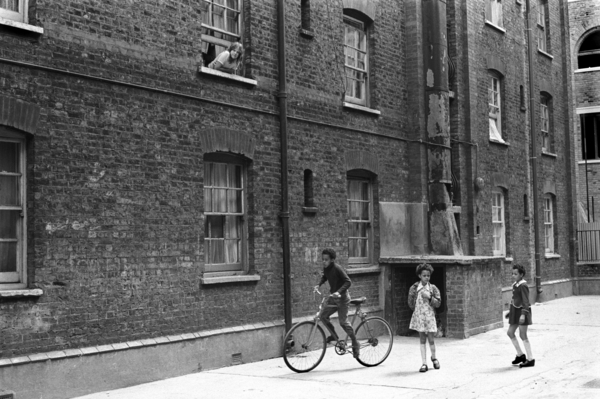 Great read thank you my family lived at great eastern buildings in the early 70′s, I have fond memories of learning to ride my bicycle on the roof top. Also remember running down to the corner shop the get some much deserved sweets. I can also recall going with my mother down to petty coat lane market and looking at the animals that would be for sale on market stools peering in to the cages that they were held in. How things have changed in 40 years. I lived across the road from Great Eastern Buildings, in Grey Eagle Street, we had two rooms and an outside toilet, a few doors along from Leon’s shop. 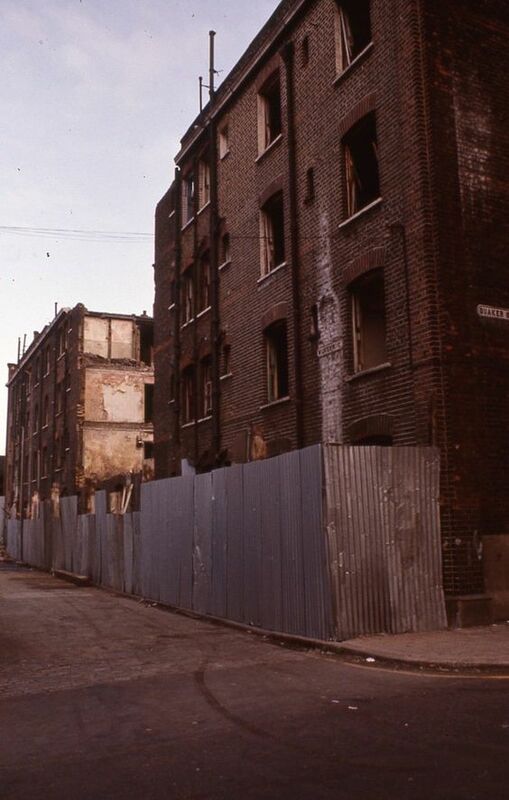 My mum and dad had friends who lived in the’buildings, the Holmes who later later moved to the Isle of Dogs. I remember the huge fire over the railway in the goods yard I think, about 1963/4 . We left there in 1965 and moved to Hackney. Many thanks for this….a wonderful read. You paint such vivid pictures with your prose. My father, Fred Harrison grew up in Great Eastern buildings. He had a sister called Dorothy and his Mother’s name was Florence. Do you have any memory of that family?